Cacao is one of the highest food sources of antioxidants. Cacao pods are obtained from a fruit tree called Theobroma Cacao and when the pods are cracked, the cacao beans obtained are processed into cacao butter and raw cacao powder. The whitish outer lining of the bean is processed into cacao butter while the remaining part of the fruit is used to produce the raw cacao powder. Aduna Super-Cacao is made from specially selected, high-flavanol cacao beans which contains at least twice the amount of flavanols in regular cacao powder. Flavanols are a plant based antioxidant with distinct health benefits. In general, antioxidants counteract the effects of free radicals in the body, but there is a wide range of antioxidants which provide various benefits in different parts of the body. Specifically, flavanols impact on the cardiovascular system by promoting a healthy heart and efficient blood vessel function. Flavanols increase the production of nitric oxide, which causes the thin muscles surrounding the blood vessels to relax and dilate. Dilatation of the blood vessels improves blood flow and normalises the blood pressure. A healthy heart and blood vessels are essential for transporting oxygen and other essential nutrients to various parts of the body. It is regarded as a super-food because it contains significantly higher quantities of essential nutrients. It is an excellent source of mono-unsaturated fats, cholesterol-free saturated fats, vitamins and other essential minerals such as magnesium and potassium. Every cell in the body contains magnesium. It is involved in several reactions that take place in the body, but one of its major roles is to act as a co-factor in the body’s enzymatic reactions. Magnesium facilitates the uptake of glucose by muscle cells and the removal of lactic acid from these cells. This is why Aduna Super-Cacao is so efficient in boosting energy levels and enhancing the performance of athletes. It is known to contain an endorphin which is produced naturally by the human body to improve the mood and reduce depression. This endorphin boosts the production of a ‘feel good chemical’ in the brain called serotonin which helps combat stress and improve the mood. Another mood enhancing chemical that can be found in cacao powder is phenyethylamine (PEA). This chemical stimulates the body’s central nervous system, promotes alertness and helps the mind to focus. You can enjoy the delicious, rich chocolate taste of Aduna Super-Cacao by sprinkling it on your smoothie bowls or simply using it in place of cocoa to create delicious home-made chocolates and your favourite baked treats. My absolute favourite way to use Aduna Super-Cacao is to make my own chocolate. It’s super easy to make, and just takes 10 minutes to prepare. Just add equal quantities of your favourite coconut oil and nut butter, (I usually use about 2 tablespoons of each) into a food processor, add about 2 teaspoons of agave syrup, and a tablespoon of Aduna Super-Cacao. Mix it all up until it forms a smooth consistency. Give it a little try, and if you think it needs more cacao or agave, just add it to taste. Spoon the mixture into an ice-cube tray, or simply onto a piece of oiled baking paper, and stick in the fridge to set. Et voila, beautiful, anti-oxident and nutrient rich, energy-giving chocolate! You don’t need to feel guilty sneaking a piece of this! 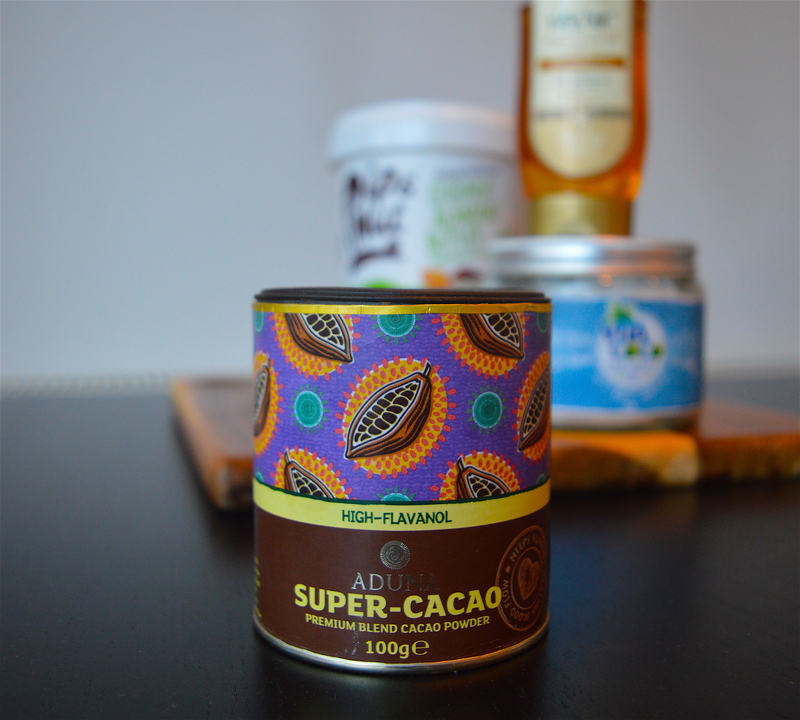 You can buy Aduna Super-Cacao here, and also get inspired by the amazing recipes to try, here.